I’ve been creating websites, as project manager or project director, over the last fifteen years. Believer of an open and shared economy, I launched a web studio with some friends to do amazing internet projects, and worked in management and content production for banks, governing bodies and the like. Now I am ready for the next challenge. These are my digital highlights. 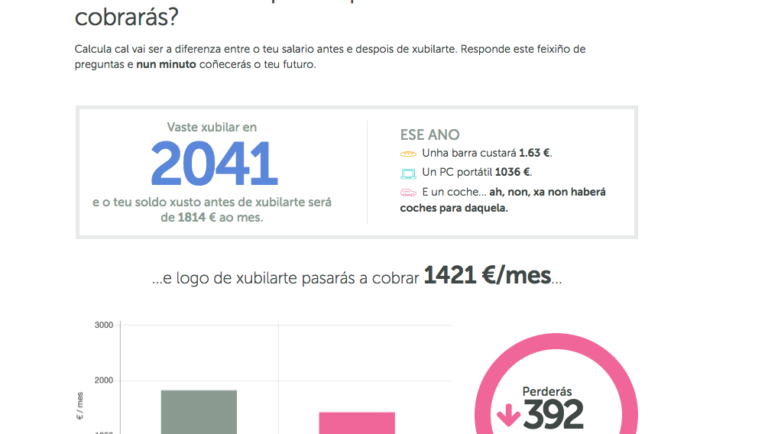 Over the last three years I have been leading a digital project for a bank, a medium-size, Spanish bank. This was my company’s main project. As a team we developed the bank’s new website, launched its new digital strategy on the web and designed, produced and edited bank’s trading website. Getting this contract was one of my career best moments: as a company we were punching over our weight, but I secured the deal. Working for a bank means trustability. The project was very intense, working almost every day for three years, dealing with changing deadlines and recalculating our plans nearly every week because of the changing environment. My tasks ranged from the largest to the smallest: I lead the project, managed the team and project’s resources, did the numbers and the admin tasks, and some times even did last-minute edits in contents or layout. I consolidated my managerial skills and improved my team working abilities, but also I learned a great deal on internet banking and on the main challenges that lay ahead of this sector. For 9 years I had my own company, A Navalla Suíza. I founded the project in 2008 with other 4 partners, the perfect ones as they have the experience in their respective fields (programming, design, front-end development, audiovisual content). We also had worked together in previous projects and liked it. 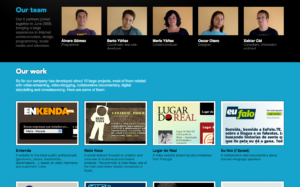 We wanted to create cool, amazing projects in internet, and despite all the difficulties (economic crisis in Spain, a sector highly dependent from the government, being located in a Spain’s corner far from the techie places), we reached the top: we got contracts with the largest bank, the largest IT company and the largest NGO in our region. Also we pushed for a more open internet with pro bono projects, as we all believed in the culture of sharing. In that company, I was the one who got those three major contracts (among many others). I also planned most of the projects and dealt with most of the clients. I also did the numbers, and managed the HR area, and sold company’s ideas and new projects to clients. And of course I worked in content management and production, which was my background. For some years I was a one-man band for all management tasks, a job who confronted me with everything, from paying taxes and dealing with banks and contractors, to contesting in a festival in Cannes (France) with a very innovative project of AR (and we won the prize!). But a decade of all that excitement is enough, particularly since I lived in the UK, 2 flights away from my job. Now it’s time for me to move to new projects. Back in the day (2006, just before the crisis) I was working in Galicia and felt that I could go no further in my professional career there. I had the opportunity to move to the UK, to lecture at the University of Stirling, and I grabbed it. During those 3 years of that fixed, non renewable position, I discovered the magic of teaching and learned the British way to do management (and liked it), without forgetting my digital soul. My mission was to teach my own language, Galician, for what I had my BA in Linguistics, my official qualification as a teacher and also some experience as a volunteer, teaching Spanish to Polish students. I had to prepare my courses from scratch, to adapt myself to a completely different environment, and to organize and produce cultural events to complete students’ experience. Teaching as a visiting lecturer was definitely a great, unbelievable experience. Passionate about open standards and user experience over the last years I delivered workshops and directed freelance consulting projects with a healthier, better, more efficient web always on my mind. I worked extensively on open formats and licensing, particularly in educational environments, but also assessed university workshops to use the internet as an educational tool. But the most recent of these projects was an intensive consulting for a medium-size university in Spain, on the ways to implement digital change. For this project I gathered stakeholders’ needs and elaborated the structure for the university’s new website, dealing with multiple interests and administrative inertia. My generic résumé is available online with all bits and pieces of my professional career, non-sport related, in chronological order. It can be downloaded too in English and in Spanish. Click on the label for my sport experience, too.